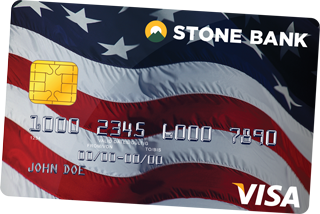 For Veterans, Active Duty Military, Police, Firefighters and First Responders, Stone Bank is the Home of The Free, a FREE checking account, with a FREE ATM/Debit card personalized with your branch of service, FREE checks, FREE safe deposit box, and INTEREST on your entire account balance. We will also add a $100 bonus to your account on the first direct deposit*. Because you stood up for us, Stone Bank wants to salute you with TRIBUTE, Our Free Interest-Bearing Checking account. Tribute Checking requires a $100 minimum opening deposit and interest is paid on the entire balance. Other restrictions may apply. *APY = Annual Percentage Yield. Free first order of checks. Safe deposit boxes subject to availability. Direct Deposit bonus paid when first deposit is received. Call for details.